In Star Wars Galaxies you can do just about everything besides make music. SOE and LucasArts didn't want to give players the ability to make their own music for fear of someone making a Madonna or MC Hammer tune and them (OE or LucasArts) having to pay licensing fees or something like that. 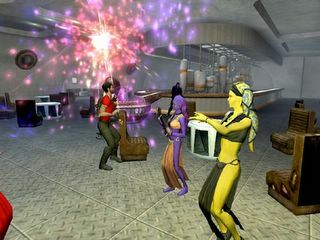 "If we allowed someone to play anything they want, they could play a song by Madonna and then we'd have licensing issues," said Julio Torres, a producer for Star Wars Galaxies at LucasArts. "We don't want to give them the option to try, because the bottom line is, if we open that gate, they will go through it," he said. Way to stifle creativity guys!